Don’t let public speaking stop you from reaching your full potential. 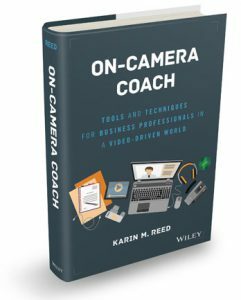 Get the most from your communications efforts—on camera and off—with On-Camera Coach by Karin M. Reed. For the business executive of today—and surely of tomorrow—being able to communicate through a camera is an essential skill. It’s powerful. It’s immediate. It’s often necessary to reach global audiences. For the business executive of today—and surely of tomorrow- being able to communicate through a camera is an essential skill. It’s powerful. It’s immediate. It’s often necessary to reach global audiences. It’s never been easier to leverage video across the corporate landscape to reach both internal and external audiences. Cameras are no longer confined to studios or designated video conference rooms; they’re on our phones, our laptops, and our tablets. A face-to-face meeting with a client on the other side of the world may require only a video chat app and a strong Wi-Fi network. But speaking to a camera is not like speaking to a roomful of people you can actually see. It requires an entirely different skill set—one most people don’t innately possess. This book aims to take the mystery out of communicating through the camera and provide specific tips and techniques that can make your message sing—and you, the messenger, feel confident in a job well done. Download your FREE chapter of On-Camera Coach and get the insider tips you need to speak with confidence on-camera and off. This is one of the best professional training experiences I've ever had. The course was fun and Karin's depth of experience provided valuable perspective. She gave constructive feedback with warmth and humor, and showed us how to play to our strengths. I was nervous about this training but so glad I took it. Video is possibly the most effective media for reaching other people, conveying ideas, and selling products. Karin Reed’s training gave me the edge I needed to produce professional quality videos. Whether you want to promote a startup, communicate with colleagues, or apply for a job as a news commentator, On-Camera Coach will help you polish your skills for optimal results! Karin accomplishes what few authors can – she reaches through the pages to personally connect with the reader, turning what might have been a book about on-camera tactics into a supportive and educational conversation. Her insights are simple, direct and effective. If you’re looking for a guide and mentor to mastering on-camera communications, look no further. Karin is the coach we all want in our corner.